Society Maintenance is a process of maintaining all the Society facilities such as Lifts, Transformers, Generators, Gym Equipments, Fire Fighting equipment, Swimming Pool etc, addressing queries or issues of the residents, keeping track of all the inventory, tracking attendance of staff etc. Is Society management, maintenance of facilities and taking care of residents issues taking away too much of your time and energy? Used by 18,500+ housing societies in India across 80 cities, we are India's #1 Apartment Management, Accounting and Communication platform! Facility Management in your Housing Society; maintaining & managing Lifts, Generators, Transformers, Fire Fighting equipment, Gym Equipments, Swimming Pool machinery, etc. getting them serviced in time, making sure you are not being taken for a ride by your service provider. Management Committee members and Society Manager spends a lot of time in people management addressing queries, issues of residents. Keeping track of all the inventory in the Apartment Complex like diesel, bulbs, manure for gardens, etc. View Statistics on ADDA Usage and fix bouncing Email Addresses to drive usage. How you will transform maintenance your Society using ApartmentADDA? Facility Management - One central module to maintain details of all facilities in the Apartment Complex, related documents, service history, maintenance dates, complaints record. Inventory Tracker - Setup all details of inventory in your housing society, maintain vendor details, payment history, invoices, configure detailed automated reports on consumption and much more. 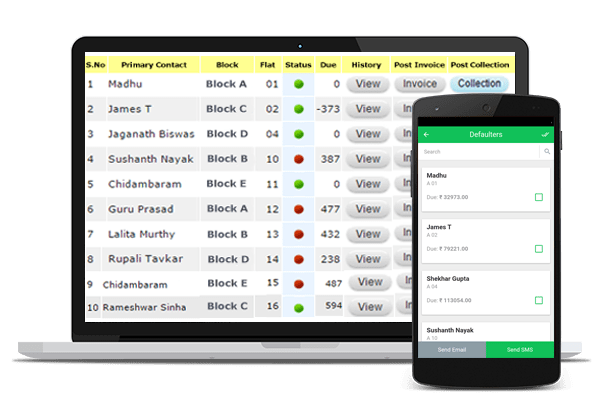 Helpdesk Tracker - Central tracking of complaints, suggestions, requests along with setting up clear task owners, timelines and escalation matrix help in speedy resolution of issues and satisfaction of residents! Staff and Visitor Management - Maintain data in directories, track entry/exit details, generate reports on intelligence gathered. And this is just the beginning. Experience convenience in society maintenance and management as never before! ADDA provides you with all features you need for efficient and effective Apartment Management, including Parking Manager, User Management, Document Management, Project & Meeting Manager and much more! Start using ApartmentADDA, and say goodbye to your Society maintenance & management related woes! For all Management Committee / Apartment Association / Resident Welfare Association members, we have made Society Management extremely easy! ADDA also provides you with a free and Private Social Network for your Housing Society and complete suite of Society Accounting features.